Looks great but you can't actually wear every item on the crafting list. I've crafted Greybeard Outfits and Executioners Robes many times f.e. but can't find them in my inventory afterwards, so I can't wear them either. Be careful doing that as it leaves the item invisible in your inventory and it even takes up extra weight as well. Use the console to find the information in order to use the proper console commands in order to remove said item. Is there any way you could add something in the homes too, or at least in the cities? My Dovakin lives so far away to have to travel to the stone or Solitude just to craft clothing. Even better would be if could add the menu to the forge or leather tanner. I didn't want to add it to the tanner, but I can add it to more locations. I might even make two versions, since some people have overhauls for major cities and houses. 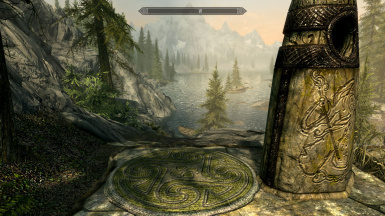 This mod might clash with those if I add rugs. I didn't look at combining this mod with others. Mainly because I prefer the mod not to be dependable on others. That means that currently, you can onlly craft clothes that were already in the game. 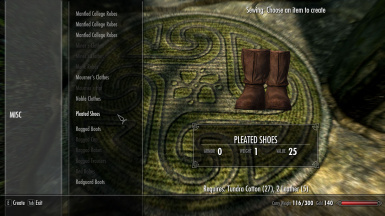 You can craft a few types of clothes that are normally only available through console commands. Got it. Thanks for the quick response. I like this idea. Can one make only the game-basic clothing or mod-added clothing as well? 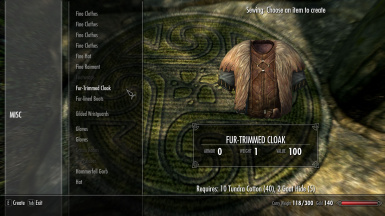 My mind is whirring with ideas to expand this mod such as a minimal tracking script (as used in "Become a Bard) so one must start with basic clothing and advance by repetitive use to more expensive clothing. What didn't work about sitting on the rug? 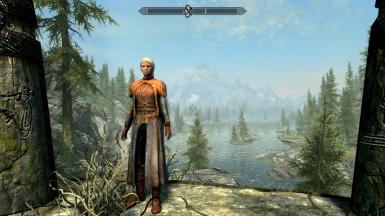 The "Sit Anywhere" mod lets the player character sit cross legged and still interact with the world. Perhaps Shevyi, the author of that mod, can offer some ideas. Instead of the rug idea have you considered tapping into the spinning wheel?